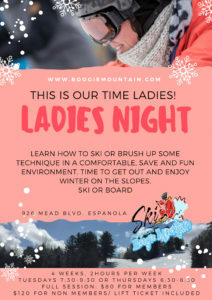 Boogie Mountains own Snow Sports School “Hutch Academy” offers several types of ski and snowboard lessons for beginners or those looking to improve their skills. Select the lessons that meet your needs. 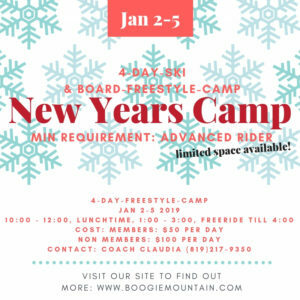 For HOLIDAY Freestyle CAMPS (Christmas & New Year) – scroll down! *Buy a booklet of 5, one or two hour lessons and get 10% discount. *Rentals for the lesson: $10.00 per person. *During the time of the lesson lift tickets are included. 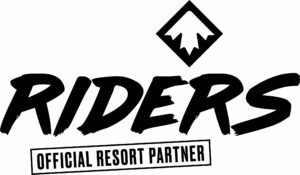 2018 – during the week only (Tuesday + Thursday 4-6) special rate! 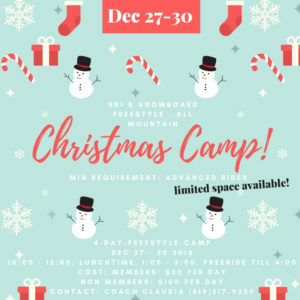 2018 – during the week only until the holidays (Tuesday + Thursday 4-6) special rate! Hurry up ! Places are limited ! Remember to sign up your children for lessons in advance to make sure they have a spot in the group and time slot of their choice. 1. talk to or text Claudia and reserve your spot!